Broadway’s The Color Purple is a truly amazing work of art. Now that it is coming back to the stage, excitement around the production is soaring. 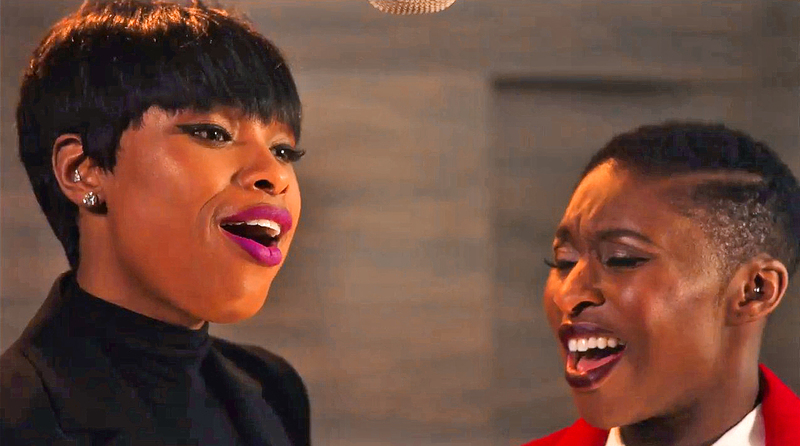 To keep the momentum growing, the show has released a music video for the musical’s theme song, spotlighting two of the show’s leads: Oscar winner Jennifer Hudson and UK theatre phenom Cynthia Erivo. To call it phenomenal is an understatement. When it was announced that Jennifer Hudson would be joining the new troupe for Broadway’s The Color Purple, we knew the show was destined to be a smash (again). But when they added UK star Cynthia Erivo and Danielle Brooks (best known for her role as “Taystee” on Orange Is The New Black) it sounded like they were stacking the deck. The clip below is a clear indication of why. Their glorious duet of “The Color Purple” is just a taste of what we can expect when the stars take the stage. As expected, Hudson wields her commanding voice with ease throughout the composition. Erivo, the Celie to Hudson’s Shug, perfectly complements the former American Idol contestant, proving that she is also a force to be reckoned with. The Oprah Winfrey-produced revival, directed by John Doyle and based upon the classic Alice Walker novel, is scheduled to begin performances at the Bernard B. Jacobs Theatre on November 9, with its official opening night set for Thursday, December 3.